A new 4,500-square-foot temporary structure at Durango-La Plata County Airport is designed to relieve passenger congestion. A temporary 4,500-square-foot tensile addition to the Durango-La Plata County Airport is scheduled to open at the end of June and relieve overcrowding. The approximately $600,000 cost is partially paid for by the airport’s operating budget, with the remainder paid for through a grant from the Colorado Department of Transportation’s Aeronautical Board. The structure is temporary because a new terminal structure plan is in the works, said Kip Turner, the airport’s director of aviation. La Plata County commissioners approved the redesignation of CDOT funds at a meeting Thursday. The money was previously targeted for a project to improve the apron. The transfer of the $200,000 grant will help to finish the tensile structure. CDOT suggested this amendment, Turner said. “This will allow us to put the money toward the project that was previously funded solely by the airport,” Turner said. 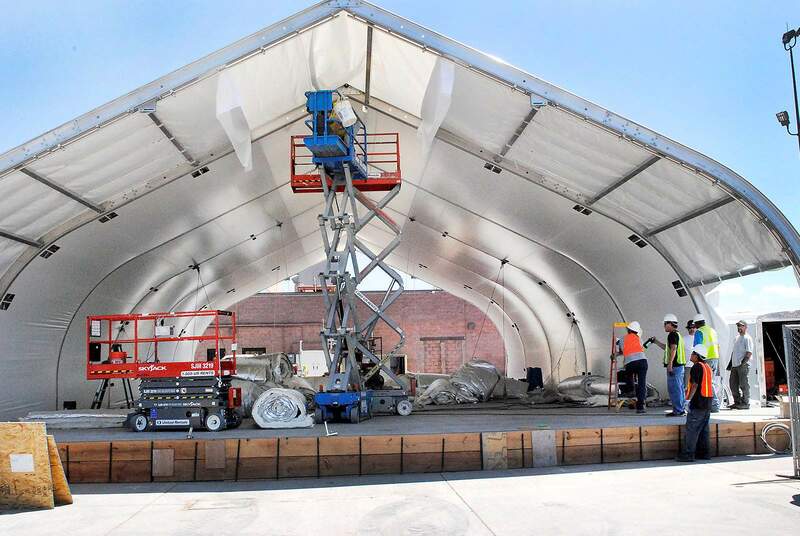 The temporary addition, which resembles the large tents seen at Denver International Airport, is expected to accommodate as many as 200 people and relieve overcrowding. The airport expects to surpass 200,000 passengers for the first time in 2013. The temporary structure will include regular amenities, although passengers will have to walk inside the permanent structure for a restroom, he said. Once the terminal expansion is complete, the temporary structure will either be used for a different function or will be sold, Turner said. In another effort to alleviate congestion, a second TSA security line is being put into place. Complaints from passengers who said they have missed flights because of long security lines prompted the second line. Turner said in Thursday’s meeting that the second line was expected to open Friday. As of Friday morning, it was not in operation. Meanwhile, the airport will update its master plan. Turner presented a new $400,000 grant agreement to county commissioners Thursday. The grant will be used to revise the terminal master plan and for continued design efforts for terminal expansion. This agreement is among CDOT’s Aeronautical Board, the city of Durango and La Plata County. The current master plan, which discusses what the airport needs to do in terms of future infrastructure, its abilities, employees and facilities, was created in 2010. It needs to be redesigned because the numbers and data from 2010 have significantly changed to the betterment of the airport, and the data needs to be reassessed before the airport goes through with expansion, Turner said. “This is a very timely award and timely plan that the airport is very excited about,” he said. Emily Griffin, a summer intern at The Durango Herald, is a Fort Lewis College student. Email her at egriffin@durangoherald.com.